We are often asked about the storage and shelf life of our thermal paper rolls. 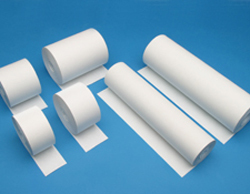 Listed below are some general thermal paper storage and shelf life recommendations. Shelf Life - Storage of thermal products in a dark place at a relative humidity between 45 percent and 65 percent and a temperature below 77°F (25ºC) will assure satisfactory performance for at least three years from the date of manufacture. Image Life - Once thermal paper has been imaged on the recommended equipment, it is expected that the image will remain legible for at least seven years, assuming the documents are properly stored with compatible materials under normal filing conditions, with a relative humidity between 45 percent and 65 percent, as well as a temperature below 77°F (25°C). Fade Resistance - Most thermal products use dye and co-reactant technology to form an image. The combination is sensitive to ultraviolet (UV) light and may exhibit some image decline with extended exposure to office light or shorter exposure to intense UV light (sunlight). The stability of the image will depend upon the degree to which the image was originally developed, the individual product design, the intensity of the UV light and the character of UV (percent of UV range in a light source). Sheet discoloration may also occur with prolonged exposure to UV light. An exception to these general guidelines would be our specialty top-coated media, tag, ticket and label grades. Note: Most thermal papers, regardless of the manufacturer, are susceptible to many of the same items shown on this page. These incompatible substances are not unique to any thermal products. Please feel free call us if you have any questions on thermal paper storage and shelf life recommendations.